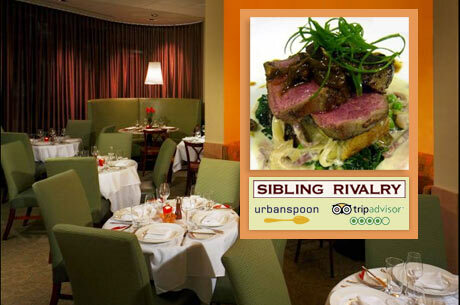 A Boston Food Diary: Give Away Time: Sibling Rivalry via Eversave Boston! Give Away Time: Sibling Rivalry via Eversave Boston! Siblings...they really are the best aren't they? This past weekend we celebrated my sisters birthday (the number of which I won't say) and, as usual, we spent a fair amount of dinner reminiscing. Do you all do this? Once all of the catching up is complete, and plans are made, a stroll down memory lane always seems in order. Of course, more often than not this includes a look at the silly things that we used to do to each other as kids (countless leaves and twigs were consumed), our memories of watching the rather attractive high school boy who used to mow our lawn in the summer months, and the hilarious stories of the times we worked together scooping ice cream. These stories, our memories of sharing our lives together, are hysterical to us, though I'm sure that any guests who dine with us, or share these times with us in any capacity, feel truly confused or left out. Honestly though- isn't that the best part of family? Remembering times that friends weren't present for, and reminiscing about parts of our lives unique to our childhood homes? There is a restaurant in the South End of Boston that tries to encapsulate this very idea. Run brothers, Chefs David and Bob Kinkead, Sibling Rivalry creates a menu celebrating all of the joys and hardships of siblings- the competitive nature that forces us to be the very best that we can be. The menu duels through ingredients, pitting brother against brother, creating dishes that will be appealing and delicious to their patrons. The beauty here is that the guests of Sibling Rivalry get to savor the sweet benefits of their rivalry. Last summer I had the pleasure of attending a luncheon at Sibling Rivalry and greatly enjoyed the dishes before me- ever since I have been wanting to go back to enjoy the full experience. Today, Eversave Boston is offering one heck of a sweet deal- $20.00 for $40.00 worth of food at Sibling Rivalry-which alone is a pretty good deal!! However, they are making it even sweeter by offering one reader of A Boston Food Diary a free pass at this deal- meaning- one reader will win a $40.00 gift certificate for Sibling Rivalry! That sounds pretty fantastic to me! To enter- please leave a comment below with your favorite childhood memory (sibling related if possible) and for extra points please tweet "I want to win today’s Save to Sibling Rivalry from @EversaveBOS and @BostonFoodDiary!" OR leave the same on my facebook wall! We'll run this contest from today until Monday at noon- so get your entries in! My favorite sibling memory is when my little brother was an elf for halloween....then decided he wanted to wear the elf shoes (with little curled toes) for several weeks after. I grew up with two of the best older brothers ever. How can I pick just one memory from childhood?! I guess it was spending time at our house on the Cape. We'd spend all day at Balston Beach - We brought sandwiches and iced tea in the cooler and made a day of it. One brother would throw around a football with me while the other would build a racecar in the sand. I want to be there now! I think my favorite memory from growing up was learning to bake with ym Grandma and my Mom. It was something of interest to them but became my absolute passion, and it was fun all of us learning together. We still do it today! My fav childhood memory is any summer spent on the Vineyard. Months of pure bliss...Ahh to revisit that time when I had no cares in the world other than hitting the Inkwell. one of my favorite childhood memories with my sister are definitely family ski trips. we'd get lost in the glades trails for hours, so many funny pee your pants moments jumping around and over trees and streams. we were nuts! Graeter's Ice Cream- a Cincinnati Treasure!